Just in time for Valentine's Day!! I am excited to announce a new collaborative workshop with the ladies of Art to the 5th™ - CARDBOARD CRUSH! Ready for a project you can “crush” on?! Straight from our personal retreat, we are bringing you Cardboard Crush, the project we loved so much we had to share! This thick and abundant journal is jammed with color, design and stitching. The perfect place to stash your treasures, love notes, inspirations, photos or mail art. We provide FOUR entirely different takes on the body of the journal so you are sure to find just the right one to “crush” on. With 16 videos, we will take you step by step through the process with tips and favorite tools. The interior can be completed using our instructions or completely customized to meet your needs. Whatever your heart desires - It is CARDBOARD CRUSH! Join us at The Art5 Academy HERE!!! Welcome to another week as we journey through the year creating in our art journals. I am often asked about creating layers and how to know when a page is finished. That is a hard question to answser but somehow I just know. For this journal page I worked to a layer that would be nice as it is but I go on to add in more. It is hard to create the "look" of layers without actualluy creating them. I often find that it takes several layers before a page starts to really come together. What do you think? 1. Circle marks made with a Stabilo pencil. 2. Rubber stamped leaf from the Natural Elements Collection by Rae Missigman and white paint dots. 3. Doodle marks made with a Stabilo pencil. 5. Black lines made with a Stabilo pencil. 6. Color in the flower petals with paint or crayons. 8. White swirls and scallops made with a white pen. 9. Color in the flower petals with paint or crayons. 10. Triangles stamped - from Natural Elements Collection by Rae Missigman. 11. Using a scalloped stencil, add white paint. I used the left side page in a workbook style to keep track of all the products I used. 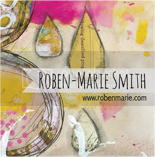 Magic happens when you digitally combine prints made with the Gelli Arts Gel Printing Plate! Coming soon...a printmaking class and a funky folder with pockets and inserts!! I woke Saturday with butterflies in my stomach but excited to be teaching my first in person class in over seven years at Stamp & Deliver in South Daytona Beach, FL. It was such a joy to spend the day with an amazing group of women who were fun, encouraging and kind! What came back to me was how much I do miss interacting with my students one-on-one, sharing a love of art and spending time together laughing and talking. Thanks to all the wonderful ladies who made it possible. You were a blessing to me!! This photo pretty much sums up how I felt teaching in person again! I am not quite sure where the first two weeks of 2105 have gone but among the chaos I have made it a priority to be still at least once a day and I don't count the time before falling asleep at night. If you have been keeping up with the buzz then you know The Original Documented Life Project™ kicked off the new year with a bang! Today, the Art to the 5th™ team has announced its line-up of featured artists. These amazing creatives will join in during the year, taking on a weekly challenge with their own unqiue styles. Be sure to visit the Art to the 5th™ website to see the AMAZING LINE-UP! I was excited to be invited to participate in Ranger's Annual CHA Designer Challenge 2015! The challenge was to use all Dina Wakley/Ranger products to create an art piece that is now being displayed along with other art pieces at the CHA 2015 show in Anaheim, CA.